Build the perfect country house, drive the pretty lilac-coloured car and do so much more with this great starter set. Containing a huge variety of bricks and elements in an array of colours, the LEGO Pink Brick B ox set has everything young girls need to create a world of building fun. Comes in a sturdy LEGO brick storage box. Includes a booklet containing easy-to-follow building instructions and inspirational ideas…. If your favourite colours are pink and purple, the Lego Pink Brick Box is perfect. The 224 pieces let you build loads of different houses and vehicles, and everything packs away into the handy carry case so there are no excuses for not tidying up afterwards. This toy costs approximately £12.99 (for the latest and best prices make sure you check our retailer list for the LEGO Pink Brick Box 4625 above). 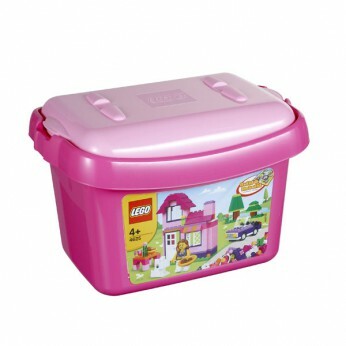 In our review of LEGO Pink Brick Box 4625 we classed it as being suitable for ages 6 years, 7 years, 8 years, 9 years, over 10 years but recommend you check the manufacturer specific advice before purchasing.